The Delta Research and Educational Foundation (DREF), in collaboration with Delta Sigma Theta Sorority, Inc. (DST), embarked upon a successful educational endeavor, which aimed to enhance student academic achievement by focusing on improving teacher effectiveness. 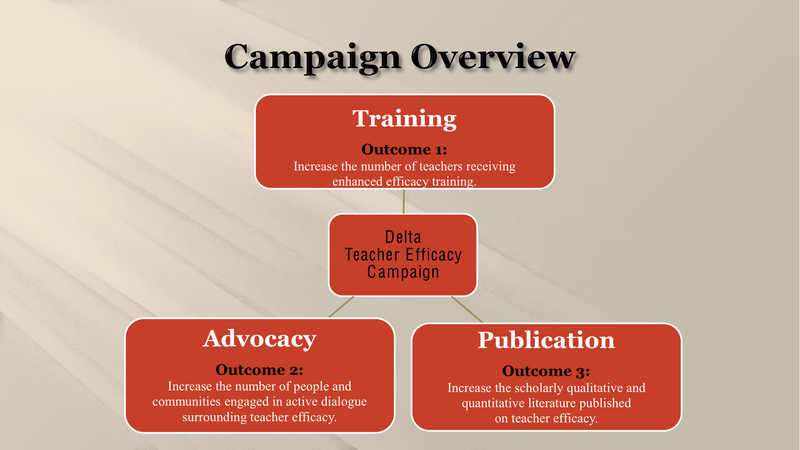 The Delta Teacher Efficacy Campaign (DTEC) emanated from the Foundation and the Sorority’s joint commitment to ensuring that all students are educated in a manner that prepares them to enter and excel in college, and, ultimately, create a thriving life and career for themselves. The Campaign began July 2014 and ended in April 2016. DREF received a matching grant of $450,000 from the Bill & Melinda Gates Foundation to support The Delta Teacher Efficacy Campaign which focused on addressing the needs of the teachers. The Delta Teacher Efficacy Campaign supported teachers serving students of color as it considers the key findings of the Measures of Effective Teaching research project conducted by the Gates Foundation. The DREF-DST collaborative included a three-prong approach: training for teachers, conducting advocacy sessions for communities, and publishing scholarly research on teacher efficacy and student achievement in PHILLIS: The Journal for Research on African American Women published by DREF.